It is relatively seldom that the contemporary computer user comes across text mode graphics. Apart from occasional frames and boxes in a Linux shell, it would most likely be an “infofile” from a pirate group with which a user would be confronted. In recent years, though, the aesthetic of text mode art has experienced a rebirth: one can buy ASCII logos printed on t-shirts, ANSI art gets featured on album covers, and some of the most proficient artists from the 1990s are making impressive comebacks. Yet all this mostly takes place outside text mode graphics’ natural habitat: the screen of a text-only operating system. The history of character-based art is much older than that of the home computer. However, one of the most influential and prolific breeding grounds of text mode art in North America and Europe has been the array of home computer subcultures that is known under the umbrella term of the “scene”, a term usually employed by the subcultures themselves. The “scene” has its root in “cracking” proprietary software’s copy protection and circulating such “cracked” programs in the 1980s and early 1990s – an activity that found its form in a distinct subculture (often referred to as the “warez scene” in the US-American context) with own rituals and value systems, and later on gave birth to creative digital subcultures such as the demoscene or the music tracking scene. Characteristics that unite these cultures, apart from their historical roots in the heyday of home computing, are their forms of socialisation (individuals taking on pseudonyms and banding together in groups that compete with each other in a particular field of computer activity), their approach to proprietary data authorship and ownership (the concept of cracked or self-programmed software constituting a “release” that is not to be altered and re-appropriated by other scene members) (Vuorinen 2007), their attachment to particular computer platforms (Reunanen and Silvast 2009), and last but not least, their affinity for artistic text mode graphics which they used for the digital “packaging” of their output as well as for the design of their pre-WWW communication channels. It is in this context that text mode art could gain traction and seep into ordinary users’ everyday encounters with their machines. The aim of this short piece is to take a brief look at the history of text mode art as it developed within the scene. Text mode art has attracted only little attention from historical research, and even less when it comes to its history within the scene. Apart from brief mentions in standard works on demosene history (Botz 2011, 345–47; Polgár 2005, 121–22), a short general history has been presented by Anders Carlsson and A. Bill Miller (Carlsson and Miller 2012), while the text mode art scenes on the PC and the Amiga respectively have been dealt with in the qualification theses by Michael Hargadon and Heikki Lotvonen (Hargadon 2010; Lotvonen 2015). While Lotvonen roots the history of the art form in the subculture only very briefly and puts his focus on the aesthetics of ASCII art, Hargadon delivers an in-depth analysis of both the technical preconditions of PC ANSI art and its rootedness in subcultural practices, focusing his analysis on the early- to mid-1990s PC warez scene in North America. Hargadon’s research was recently taken up by Kevin Driscoll, who embedded ANSI art into the history of the North American culture of Bulletin Board Systems (BBS), the latter being a pre-WWW medium of communication and file exchange based on data transfer through telephone landlines and operating through text mode interfaces (Driscoll 2014, 191ff). My perspective is a twofold one: on the one hand, of a historian working on a global social history of software piracy in the early days of home computing; on the other hand, of someone who had followed the developments of text mode art in the scene as a participant/observer for nearly two decades. The second perspective is not employed merely to delve into nostalgia, but is a necessity given the problematic archival situation of digital subcultures, especially concerning the history of BBS culture: While the files exchanged through the systems are often archived, the BBSs themselves, in terms of their functionality, outlook and textual content, are usually not (Driscoll 2014, 22–24). The present thematic issue provides an opportunity to embed Hargadon’s findings into a multi-platform history of the scene, and to bring up a few general points regarding the history of scene text mode art which will hopefully stimulate further discussion and pave the way for further research in this area. Leaving aside the embedding of text mode art into art history and/or the history of aesthetics, and instead taking a perspective of media and social history, the points to be raised here concern the technological determinism behind the rise and fall of scene text mode art and, even more importantly, the internal subcultural dynamics that profoundly shaped the development and usage of text mode art within the honour and barter economies of the scene (cf. Rehn 2004). The arguments I will make are limited not only in terms of geography, with the subcultures in question developing in Europe and the US, but also in terms of the hardware concerned. While certain forms of text mode graphics existed on virtually all home computer platforms that were relevant for the early scene’s development, it is on three of them where one can observe elaborate subcultural practices based on text mode creativity: the Commodore 64 (C64), the Commodore Amiga, and the IBM PC. While scene graphics using the C64 character set (PETSCII) have already received their own treatment, I will focus on the traditions and developments on the latter two platforms, since text mode art on both of them a) developed under similar circumstances in terms of communicational infrastructure, and b) share the same standard (ASCII/ANSI) with a high degree of inter-platform compatibility (despite peculiarities in the respective system fonts). To explain the technicalities of text mode character sets on both platforms would exceed the frame of this paper, but a few introductory remarks are necessary. Both platforms shared the ASCII standard, featuring letters, numbers, punctuation marks, and a limited set of special characters. Also, both platforms supported ANSI escape codes, making it possible to choose 16 different colours for the characters and their background. The default character set of the IBM PC, however, known as “code page 437”, additionally featured a number of line and block characters (Driscoll 2014, 191–96). This had implications for the range of possibilities for using these character sets for drawing. While the additional “high-ASCII” characters of the PC, particularly the “blocks”, allowed for figurative “drawing” focused on form-filling and shading (Fig. 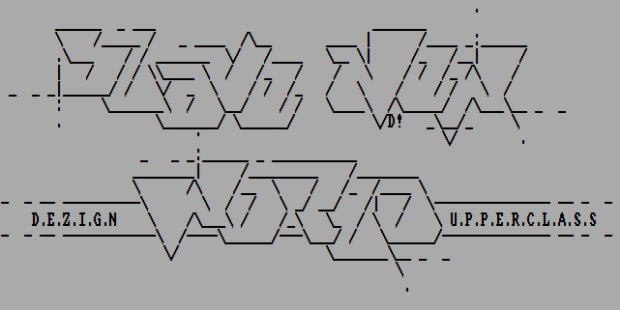 1 and 2), the limited ASCII character set of the Amiga did not provide such possibilities, leading artists to focus mostly on logo-type graphics based on outlines, not unlike graffiti “throw-ups” (Fig. 3). Drawing ASCII on Amiga, however, also had its advantages since Topaz, the standard Amiga font, had much more narrow spacing than the default MS-DOS font – thus, one could form almost seamless lines using slashes, backslashes and underscores. Figure 1. Example of PC ASCII art: Closed Society by Roy/SAC, 1995. http://pc.textmod.es/pack/sac0995/roy-csa.asc. Figure 2. Example of PC ANSI art used in BBS design: Hazard/2 BBS main menu by Avenger/BM, 1997. http://pc.textmod.es/pack/bmbook13/ave-h86.ans. Figure 3. Slave New World, Amiga ASCII logo by Desert/Dezign, 1993. http://amiga.textmod.es/colly/dezignuc/. Another consequence of the different character sets was the way text mode graphics were created. Since Amiga text mode artists used merely characters that were accessible through the keyboard, they did not need special software for creating their artworks and could use simple text editors. Text mode artists on the PC, however, could not access the “high-ASCII” characters by just pressing one keyboard key. This caused the rise of ANSI drawing programs for MS-DOS, with which artists could not only use different block characters via the function keys, but also assign fore- and background colours to characters. The first point to be made about scene text mode art is that despite its seemingly self-evident aesthetic genealogies, it developed “organically” and independently, without any continuity from earlier forms of text mode art. The development of text mode art on both Amiga and PC is bound to the practices of data exchange and social bonding over modem-facilitated connections – this thesis, convincingly worked out by Hargadon for the PC scene, is in fact true for both platforms. Up to the late 1980s, when the predominant means of data transfer within the scene was via floppy disks through the post, text mode art played only a peripheral role in the scene’s communication. While on the C64, PETSCII graphics were used to design disk directories, there was no technical necessity to employ text mode graphics on the Amiga or the PC. Moreover, in the C64 as well as the early Amiga scene, most of the scene’s artistic self-expression, apart from the actual coded productions, happened through “old” media. The age of “mailswapping” was a flourishing period for paper art, with skilfully designed disk sleeves, letterheads and paper magazines. However, when BBS became the scene’s standard medium for both communication and data exchange, artists were restricted to the limited set of characters transmittable over modem. Thus, text mode graphics found their natural habitat. Character-based graphics proved useful and meaningful to several actor groups within the BBS-based warez scene. On the one hand, it was the system operators (sysops) of “elite” BBSs who created the demand for text mode artworks – an argument which Hargadon developed for the case of the PC underground, but which holds true for the Amiga scene as well. The standard design of BBS software was simple and dull; to give their “boards” (as scene participants casually called BBSs) an individual look and let them stand out against countless competitors, sysops needed individually crafted design for their BBSs – and text mode graphics were the only technically feasible way to achieve this (Hargadon 2010, 128–34; Driscoll 2014, 191–97). On the other hand, those users who supplied the BBS file areas with “releases” used text mode graphics for their own ends. Given the nature of BBS file listing, ASCII graphics were a way to make one’s uploads stand out (Fig. 4). Figure 4. 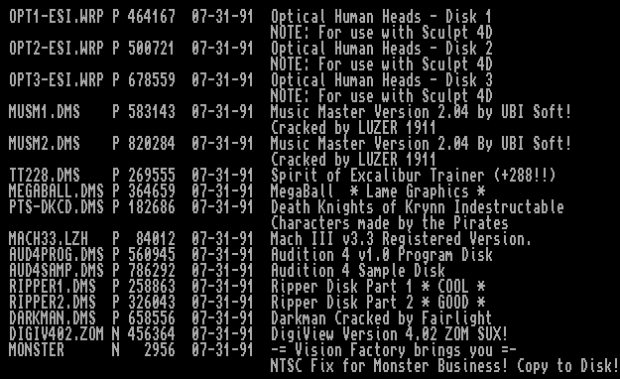 Snapshot of a file list from the music file area of the Rebels Hideout BBS (Amiga, Denmark), 1991–1992 (private collection of Glenn Lunder). Through this practice of drawing logos and then pasting them into the “file description” field, file description text mode graphics became a solid part of the “package” around a scene release, alongside the infofile and the filenaming scheme. Just as much as the crack intro (Reunanen, Wasiak, and Botz 2015), this package constituted the act of turning a “digital object into an artefact” (Vuorinen 2007, 29) and converting a commodity of the software market’s monetary economy into the barter economy of the scene. It is hard to say when exactly text mode art gained its solid place in release packaging in both the PC and Amiga scenes. 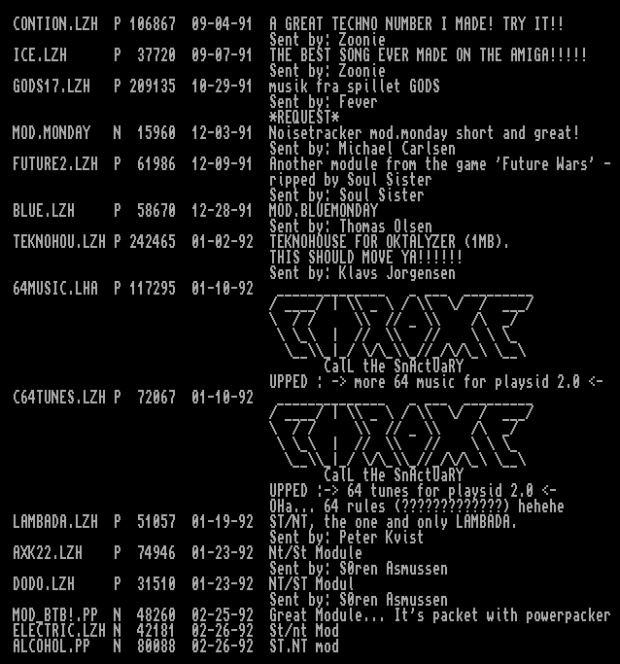 While cracking groups have often included text files with notes about their releases early on (Garrett 2004, 5–6), the infofile as a regular feature of a release, carrying the .NFO file suffix, was introduced by the US-based PC cracking group The Humble Guys around 1989–1990 and soon became a standard feature of releases on the Amiga as well. The FILE_ID.DIZ text file format, introduced around 1993–1994 by the shareware producers’ community (Holler 1994) and serving as a means for program authors to have the description of their programs to be automatically displayed by BBS file lists, was immediately picked up by the scene on both platforms (Polgár 2005, 121). The format’s limitations (45 characters wide, 10 to 15 lines long) posed a special challenge for text mode artists, yet it was a rewarding one: the FILE_ID.DIZ file description was the first thing a BBS user saw of a particular release, even before downloading it. 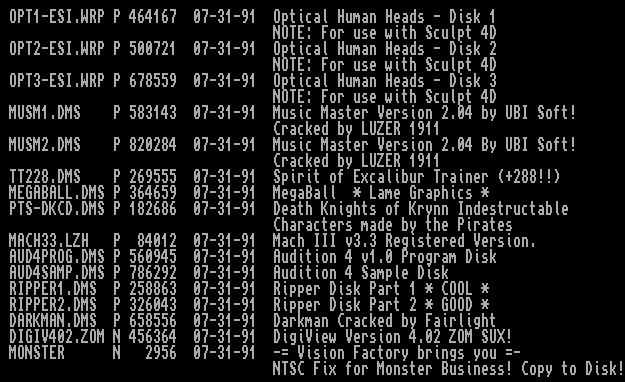 As FILE_ID.DIZ files were displayed automatically by the BBS software right after the upload, this format provided the warez groups with a chance to gain monopoly over how their releases would appear in a BBS file list, denying the uploaders the chance to add their own (possibly critical) comments to the releases. At first glance, this development might seem as a stifling of ASCII artworks, since BBS traders such as the aforementioned Rotox could no longer add their own artworks to their uploads. However, since the release groups used the FILE_ID.DIZ as a kind of trademark, they needed skilled artists to provide them with appropriate logos, thus assigning them a fixed role in the process of creating releases. Figures 5 and 6. Snapshots of file lists from The Edge BBS (Amiga, USA), 1991 and 1993 (private collection of Glenn Lunder). Fig. 6 features FILE_ID.DIZ logos from the cracking groups Digital, Delight and Anthrox. Notice the uploaders’ judgemental comments on the releases in Fig. 5 – a thing rendered impossible by the usage of FILE_ID.DIZ files. 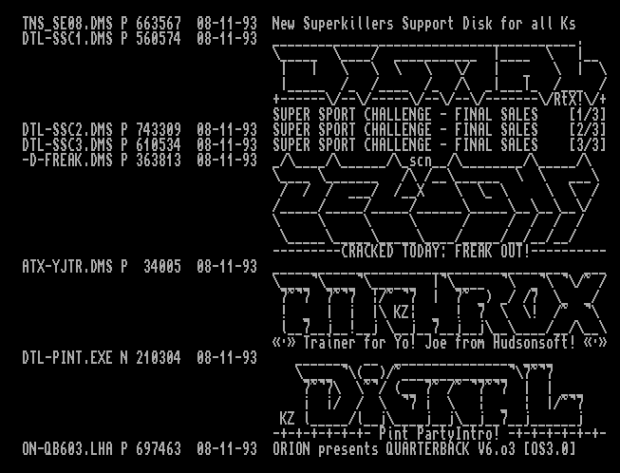 Through the demand of both sysops and release groups, the creation of text mode graphics within the scene turned from a spare time activity of BBS traders into a self-conscious scene “profession”, along with other scene-internal roles such as cracker, programmer, musician or original supplier. Text mode graphics became a commodity with an ascribed value in the scene’s barter economy, and a means for text mode artists to gain “subcultural capital” within the scene (cf. Thornton 2005). Text mode artists and release groups thus entered into a symbiotic relationship. Groups were interested in having custom-made ASCII art for their releases, since the first visible aspects of a release, its “business card” so to speak, were reduced to text mode: the FILE_ID.DIZ, visible for the BBS user while browsing the filelisting, and the infofile, visible between downloading and executing a cracked program. Text mode artists, on the other hand, could gain fame by groups using their artwork: the more active and well-respected a release group was, the more its releases circulated through the BBS networks, sporting the artists’ logos. The more popular a group’s first “trademark” – the FILE_ID.DIZ logo – became, the more other groups wanted to have logos in the same style, providing the artist with more requests and thus with more credit within the scene’s honour and barter economy. When asked about the ways his group acquired its ASCII art for release-packaging purposes, the leader of Skid Row (one of the most prominent cracking collectives in the early 1990s Amiga scene) described two means of acquisition: either he would request logos from artists he knew and liked, or artists would send logos to him out of respect for his group (Subzero 2016). Even though text mode artists often fulfilled other roles in the scene, this development meant that individuals proficient in this art form could gain entry into the scene’s inner circles without having any other technical skills, and thus profit from the scene’s social and cultural capital (networks, access to recent software, fame derived from affiliation with a well-known group). For some individuals, drawing text mode artwork was the only feasible entry point into the scene. 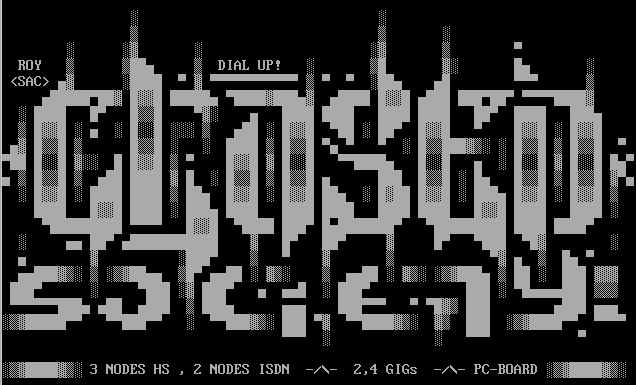 As a PC ANSI artist recalled, “I had a slower modem and not a lot of time so the only way I could get any download credit was to do ANSI really.“ (Ashes of Gehenna 2016). The demand within the scene for text mode art is also manifest in the way BBSs developed their own techniques for soliciting text mode art, such as “ANSI Request doors” – BBS add-ons through which users could get in touch with text mode artists and pass them their requests for custom-made artworks. Also, text mode graphics soon became a commodity that was exchangeable for other scene “goods” such as the aforementioned download credits on BBSs. Even remuneration in cash was not uncommon, at least in the PC scene where the larger investment of time needed to create ANSI graphics made monetary compensations more justifiable. ANSI artists would approach other scene members offering their services, or even advertise them – complete with a price list – in their artworks, while the monetary transaction would happen via cash-by-mail (Ashes of Gehenna 2016; Misfit 2016). Soon, text mode artists within the scene would organise into their own collectives: both ANSI/ASCII groups on the PC and ASCII group on the Amiga would appear during the first years of the early 1990s. The fact that these groups would use the same infrastructures as the warez scene (being listed as “affiliates” on the same BBSs etc.) shows that these groups were deemed useful and worthy by the scene peers. Their output – in forms of ASCII collections (“collies”) and ANSI/ASCII packs (“artpacks”) – were considered “releases”, that is digital commodities in the barter economy just like cracked software, which could be uploaded onto BBSs to gain download credits. In time, at least in the Amiga ASCII scene, this sort of organising began to be considered too easy a way of entering the scene by those who saw ASCII art as merely a pastime (no matter how well-respected) of people preoccupied with other “trades” within the scene. This can be seen in discussions in several ASCII collections made by established first-generation artists who thought the new generation of artists were gaining entry to the scene too easily. This tension can be explained by the fact that in the Amiga scene, the split between “legal” and “illegal” activities (Reunanen 2014) did not manifest itself on the level of BBS infrastructure: “legal-only” BBSs were rare, and the pirate releases of commercial software were often uploaded in the same file areas as the ASCII art collections, the latter clogging up the file lists from the perspective of those merely interested in cracked programs. On the PC, the scene underwent a more pronounced infrastructural differentiation: from the mid-1990s onwards a distinct “art scene” appeared, with its own bulletin board systems and other means of communication such as Internet Relay Chat (IRC) channels. Thus, when the PC warez scene moved its operations from bulletin board systems onto FTP servers during the second half of the 1990s, the “art scene” did not follow: It mostly remained within its own infrastructure of BBSs and IRC channels. Drawing requests for other scenes became less important for ANSI practitioners: aside from occasional requests by demoscene groups, the “packs” were dominated by pieces drawn either for “art scene” BBSs or simply for the sake of it. Those few PC art groups which remained closely connected to the warez scene and catered to its demand for text mode graphics, such as Superior Art Creations (SAC), were rather an exception. What was originally the standard mode of barter economy in the relationship between text mode art and the scene, was now to be found only on the periphery of the “art scene”. With the enhancement of instant real time communication brought about by IRC (which could theoretically involve, unlike multi-node chat systems on BBSs, an infinite number of participants), artists’ competitions took a more predominant role in the scene – the most prominent of them possibly being Blender, where participants had to draw ANSI artworks based on certain topics within a limited time span. Competitions which revolved around drawing artworks to be used in BBS layouts existed as well, but were less prominent. The self-sufficiency of the PC art scene also became evident in that it began producing digital content other than text mode art, such as tracked music and even digital literature (on the latter, see O’Hara 2006, 112f.). Groups dedicated to these artforms rarely saw themselves as part of the (predominantly European) demoscene; they mostly appeared as sub-groups of existing ANSI groups, the bulk of which were located in North America. All in all, during the second half of the 1990s the PC art scene came to form a self-sufficient environment that had minimal interaction with other subsections of the scene. On the Amiga, due to the reasons outlined above, this encapsulation from the rest of the scene did not take place in such a pronounced form. However, the sheer amount of ASCII artists and groups produced an oversaturation of the “market”, exceeding the demand for text mode art in BBS design and group release packaging. Major cracking and demo groups went on using the same infofile and FILE_ID.DIZ designs for years, which made perfect sense, as these served as well-tried group trademarks; newer artists, however, had less chance to see their works in circulation. As a result, the Amiga ASCII scene also experienced a turn inwards, although not to such an extent as the art scene on the PC: ASCII collections focussed less on the content than on design, requests took a back seat compared to gifts and logos drawn “just for fun”, and several scene magazines focussed on the competition between ASCII groups and ASCII-related discussions than on catering the rest of the Amiga scene with artworks. In the end, the same set of technological preconditions and subcultural practices that enabled the rise of text mode art as a distinct scene art form also proved its demise. In the course of the second half of the 1990s, bulletin board systems finally became extinct as the backbone of the scene’s infrastructure in favour of Internet-based means of communication. While the demoscene, both on PC and Amiga, began to conduct its communication over web-based forums, IRC channels, blogs and mailing lists, the PC warez scene moved its file exchange onto secure FTP file servers. The Amiga warez scene, experiencing its final peak during the third quarter of the 1990s, became extinct altogether due to the bankruptcy of Commodore and the subsequent dearth of commercial software that could be cracked; some of its BBSs, having gained a foothold into the Internet age by using the Telnet protocol, continued to remain online, but ultimately closed down due to the lack of users and new files. For text mode art groups on both the PC and the Amiga, “art for the art’s sake” seemed to prove unsustainable at first. While there were at least 706 PC artpacks released in 1997, the number went down to 191 in 2000, 40 in 2005 and ultimately 4 in 2010. As for Amiga ASCII collections, while at least 173 were released between January and September 1999, a mere 19 came out during the same months of 2003. Text mode art lost its natural habitat within the scene, and while the art form largely failed to attract new practitioners doing it for the artistic aspects, seasoned artists, like the aforementioned Rotox, ceased to “see the point unless the logos are actually going to be used on a BBS, FTP site or by a Group” (Dipswitch 2003). Only in recent years can a certain revival be observed. Fuelled by the new possibilities of instant long-distance communication through social networks, as well as the availability of new text mode graphics software enabling both cross-platform and networked drawing, both old artists making their comebacks and even some new ones discovered text mode art in the scene tradition – including the tradition of forming groups and releasing art packages – resulting in 14 PC text mode artpacks in 2016. A prominent trait of this new text mode art wave is not only the conscious breakdown of platform boundaries between PC and Amiga, but also experimentations with other text mode-based platforms such as PETSCII or Teletext. These practitioners see platforms merely as different modes of expression, not any longer as habitats and objects of fandom – a development owed to possibilities of platform emulation and cross-platform software development. Also, contrary to the traditions outlined here, the new collectives, while being conscious of their roots in the scene, are not any longer part of a scene-internal digital barter economy. Instead, they act as self-conscious participants in the field of computer art, which even includes participating in offline exhibitions. These artists take their skills, sharpened by their teenage scene experience, into a new context and use them as unique and valuable assets in the vast field of “grown-up” art. Thus, one could say, text mode art in the scene tradition has only now evolved from an applied craft to a self-conscious, independent art form. However, while writing the history of this particular art form it is not enough to focus on its aesthetics; both the technical preconditions and the subcultural economies are crucial to understanding its genesis and development. Exploring these aspects in depth is a task to be taken up by future historians and media scholars. Albert, Gleb J. 2017. ‘Computerkids als mimetische Unternehmer. Die „Cracker-Szene“ der 1980er Jahre zwischen Subkultur und Ökonomie’. WerkstattGeschichte, no. 74: in print. Ashes of Gehenna. 2016. Interview by Gleb J. Albert. FB-chat, 24 December. Botz, Daniel. 2011. Kunst, Code und Maschine. Die Ästhetik der Computer-Demoszene. Bielefeld: Transcript. Cambus, Fredric. 2013. ‘Taiwanese BBSes and Unicode ANSi Art’. Fredric Cambus’ Blog. April 10. https://www.cambus.net/taiwanese-bbses-and-unicode-ansi-art/. Carlsson, Anders. 2009. ‘The Forgotten Pioneers of Creative Hacking and Social Networking – Introducing the Demoscene’. In Re:live: Media Art Histories 2009 Conference Proceedings, edited by Sean Cubitt and Paul Thomas, 16–20. Melbourne: The University of Melbourne & Victorian College of the Arts and Music. Carlsson, Anders, and A. Bill Miller. 2012. ‘Future Potentials for ASCII Art’. Paper presented at the Computer Art Congress 3, Paris. http://goto80.com/chipflip/06/. Dipswitch. 2003. ‘Interview with Rotox/ART’. The Ascii Charts. October. http://files.scene.org/view/mags/the_ascii_charts/tac-0310.txt. Driscoll, Kevin. 2014. ‘Hobbyist Inter-Networking and the Popular Internet Imaginary: Forgotten Histories of Networked Personal Computing, 1978–1998’. PhD diss., Los Angeles: University of Southern California. Garrett, Ben. 2004. ‘Online Software Piracy of the Last Millennium’. http://pdf.textfiles.com/academics/online-software-piracy-of-the-last-millennium-1_0.pdf. Gelder, Ken. 2005. ‘The Field of Subcultural Studies’. In The Subcultures Reader, edited by Ken Gelder, 2nd ed., 1–14. London: Routledge. Hargadon, Michael A. 2010. ‘Like City Lights, Receding: ANSi Artwork and the Digital Underground, 1985–2000’. MA thesis, Montreal: Concordia University. Holler, Richard. 1994. ‘FILEID.TXT v 1.9’. http://www.textfiles.com/computers/fileid.txt. Irwin, John. 1977. Scenes. Beverly Hills: SAGE. Lotvonen, Heikki. 2015. ‘Amiga ASCII-taide’. BA thesis, Espoo: Aalto University School of Arts, Design and Architecture. Meyers, Raquel. 2016. ‘Is It Just Text?’ In Teletext in Europe. From the Analog to the Digital Era, edited by Hallvard Moe and Hilde van den Bulck, 31–49. Göteborg: Nordicom. Misfit. 2016. Interview by Gleb J. Albert. FB-chat, 24 December. O’Hara, Rob. 2006. Commodork: Sordid Tales from a BBS Junkie. s.l. : lulu.com. Polgár, Tamás. 2005. Freax. The Brief History of the Computer Demoscene. Winnenden: CSW-Verlag. Ratliff, Brendan. 2007. ‘Why Did Freely Shared, Tracked Music in the 1990’s Computer Demoscene Survive the Arrival of the MP3 Age?’ MA thesis, Newcastle upon Tyne: University of Newcastle upon Tyne. Rehn, Alf. 2004. ‘The Politics of Contraband: The Honor Economies of the Warez Scene’. The Journal of Socio-Economics 33(3): 359–74. Reunanen, Markku. 2014. ‘How Those Crackers Became Us Demosceners’. WiderScreen, no. 1–2. http://widerscreen.fi/numerot/2014-1-2/crackers-became-us-demosceners/. Reunanen, Markku, and Antti Silvast. 2009. ‘Demoscene Platforms: A Case Study on the Adoption of Home Computers’. In History of Nordic Computing 2, edited by John Impagliazzo, Timo Järvi, and Petri Paju, 289–301. Berlin: Springer. Reunanen, Markku, Patryk Wasiak, and Daniel Botz. 2015. ‘Crack Intros: Piracy, Creativity and Communication’. International Journal of Communication 9: 798–817. Subzero. 2016. Interview, Cologne. Interview by Gleb J. Albert. Audio recording, 6 January. Thornton, Sarah. 2005. ‘The Social Logic of Subcultural Capital ’. In The Subcultures Reader, edited by Ken Gelder, 2nd ed., 184–92. London: Routledge. Vuorinen, Jukka. 2007. ‘Ethical Codes in the Digital World: Comparisons of the Proprietary, the Open/Free and the Cracker System’. Ethics and Information Technology 9(1): 27–38. Wasiak, Patryk. 2012. ‘“Illegal Guys”. A History of Digital Subcultures in Europe during the 1980s’. Zeithistorische Forschungen/Studies in Contemporary History 9(2): 257–76. Woo, Benjamin, Jamie Rennie, and Stuart R. Poyntz. 2015. ‘Scene Thinking: Introduction’. Cultural Studies 29(3): 285–97. A fascinating, ever-growing collection of examples spanning over centuries is maintained by Anders Carlsson at http://text-mode.tumblr.com/. I am very much indebted to him and the issue’s editors for comments and criticism of this paper, as well as to Brendan Ratliff for proofreading and Glenn Lunder for providing me with BBS file lists. For the historical roots of “scene” as analytical concept for subculture studies, see e.g. Irwin 1977; Gelder 2005; Woo, Rennie, and Poyntz 2015. For the (self-)usage of the term by home computer subcultures, see Reunanen 2014. For the cracking scene in the 1980s: Wasiak 2012; Albert 2017. For the demoscene and particularly its contested roots, see Carlsson 2009; Botz 2011; Reunanen 2014. For tracking music, see Ratliff 2007. Due to this geographical focus, this paper omits seemingly similar developments in other world regions, such as BBS graphics in Taiwan. Cf. : Cambus 2013. See the papers by Anders Carlsson and Raquel Meyers in the present issue. However, there are also text mode graphics on the PC that use “low-ASCII” characters, particularly the so-called “$-style” which makes use of the dollar sign for form-filling, and “oldschool style” inspired by Amiga ASCII, using slashes and underscores. For a constantly growing archive of these artefacts, see http://gotpapers.untergrund.net. As an exception, one has to note the curious case of the Polish Amiga demoscene, which relied on “mailswapping” until well into the second half of the 1990s and yet had a very prolific output of ASCII art. For Z-Modem and other BBS file transfer protocols, see Driscoll 2014, 226–30. Garrett mentions 1990 (Garrett 2004, 6), while the group entry for The Humble Guys at Demozoo gives a more precise hint at a particular release in 1989: https://demozoo.org/groups/7421/. For the application of Pierre Bourdieu’s concept of different sorts of capital onto the cracking scene, see Albert 2017. For an example from 1996, see https://files.scene.org/view/resources/bbs/food/foodmao1.zip. For BBS modding, see Driscoll 2014, 162f. For download limitations through ratio/credit systems on BBSs, see Driscoll 2014, 315. For ANSI groups, see Hargadon 2010, 136–37. For over 400 Amiga ASCII groups that existed in the course of the 1990s, see http://amiga.textmod.es/crew/. See e.g. Desert/Dezign, “28 Highlightz!”, 1995, http://amiga.textmod.es/colly/dezign28/; Rotox/Art, “Description Art Volume One!”, 1993, http://amiga.textmod.es/colly/art01/. For the phenomenon of “art boards“, BBSs solely dedicated to the text mode art scene, see Hargadon 2010, 150. For the entries of the competition, which was revived in 2015, see http://pc.textmod.es/crew/the.blender/. Such as the GO! ANSI Compo between 1997 and 1998, see https://demozoo.org/groups/38846/. On the composition and content of Amiga ASCII collections, see Lotvonen 2015, 19–24. Calculation based on the release tables in the 1999 and 2003 issues of The Ascii Charts, https://files.scene.org/browse/mags/the_ascii_charts/. For PabloDraw, the most popular of such tools, see https://en.wikipedia.org/wiki/PabloDraw. For the latter, see Meyers 2016.